Hello again! This is my second post for this Sunday. I've been a very good little paper-crafter this weekend and created a total of 3 cards! That's a big deal for me. Can you tell it's football season and I am not a fan? So, while Mike is glued to the TV this is what I do. It's my goal to play along with every Mojo Monday sketch this year. So far, so good! Here is this week's sketch. I needed to make a 'get well' card for my Aunt. So I pulled out Verve's Wonderfully Made and Friendly Phrases (now retired) stamp sets. I'm a wee bit upset because when I pulled the cute little flower that comes with Wonderfully Made off the plastic sheet, I ripped it. (frown) I was able to piece it together in order to stamp the image and have attempted to glue it back together but, I'm not sure it will work. Note to self: be more careful when removing clear stamps from the backing! 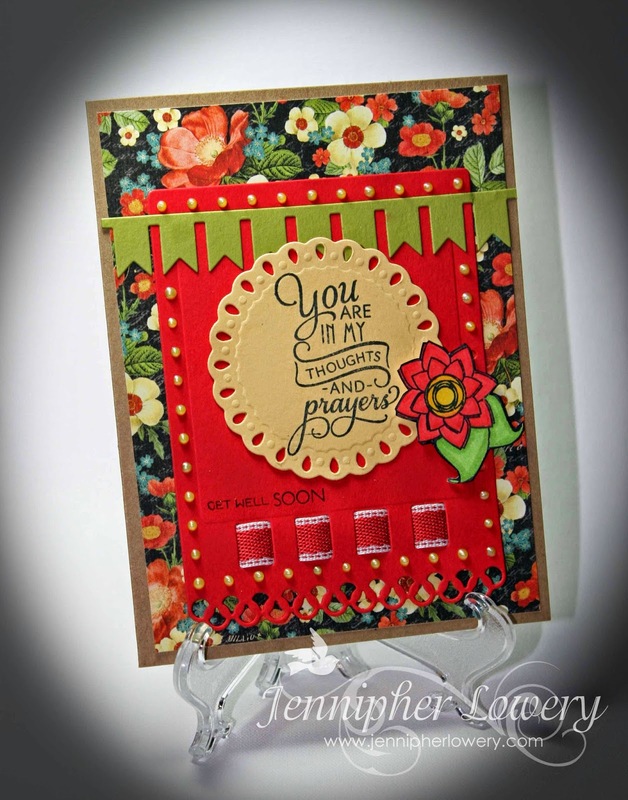 This card was super fun to make and I'm quickly learning that I'm falling more and more in love with Verve's Trim Dies. This week I used the Pennant Trim Die. Wishing I had purchased this much sooner. I have one more card to share tonight. This one was made for fun because I just had to play with one of my stencils--Texture Brilliant from Memory Box. Isn't this just groovy! Because I ended up with a tie-die effect I just had to use one of the sentiments from Verve's Feeling Groovy stamp set (also retired). Playing with stencils and inks/sprays is uber cool! But, there is one product you must have to prevent your stencil from slipping and I learned this the hard way. Invest in some Krylon Easy-Tack Repositionable Adhesive. You spray the back of your stencil (outdoors) and you have this nice tackiness on the back that holds it in place. This is especially important with the more intricate stencils as they tend to move around with just the masking or painter's tape on the edges. The Easy-Tack keeps all those intricate parts lying flat as you sponge ink across them or embossing paste, whatever the case may be. It's $7.99 for a 10.25 oz. can at Hobby Lobby. Well, that's the end of my weekend crafting! I'm so glad you stopped by. God Bless and have a Awesome week! Both cards are fabulous! Good luck with your Mojo Monday goal! You can do it! Hello beautiful... how are you stranger. I'm so glad you stopped by and giver me an update. So glad that the year is off to a great start. Nothing better than starting the year with a clean start. Absolutely stunning cards. .. love the layers on the first one and the texture and design on the second one. Stunning work. 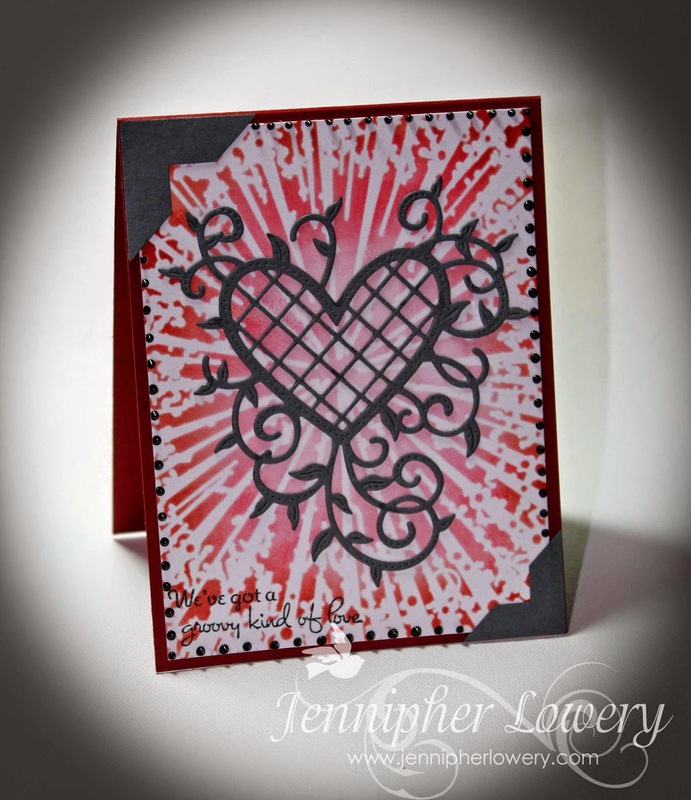 Beautiful cards, Jennipher! So vibrant and lovely! Thanks for playing along with Mojo Monday! Beautiful cards Jennipher. Especially love the second with that stencil. The black decorative heart looks wonderful over it. Sorry to hear you had a stamp accident... that is a bummer... it's a sweet flower image. Love the heart with the tie die background! You did a beautiful job with the sketch. Your card is gorgeous. And I'm so amazed at your stencil card. I have yet to play with stencils. I bought a couple but haven't used them yet. Thanks for visiting my blog and leaving such sweet comments.